Longridge CC ended their title-winning Moore and Smalley Palace Shield season with a six-wicket win against South Shore at Newsham. South Shore batted first and compiled 178-6 from their 40 overs. The foundation of that innings came from Nathan Bolus, who top-scored with 66 before becoming one of three wickets for Daniel Wilson. He also dismissed Daniel Jardine (29) and Amjad Mehmood (10) on his way to 3-52. Luke Jardine (13) was out to Jonathan Millward (1-26), while Matt Greenall (2-25) got the better of Tyne Davis (0) and Moshin Valimula (1). Aaron Perera made an undefeated 33 in helping South Shore post a competitive total. Nevertheless, it was one which Longridge chased down two balls into the 39th over of their reply. 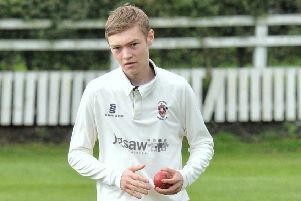 Tom Howarth (10) was an early wicket for Michael Hall, who also bowled fellow opener Neil Holden (37) to claim 2-27. Zac Christie was dismissed for 17 by Amjad Mehmood (1-36), while Neil Ashford (1-57) saw off John Simpson (16). That was it for the South Shore attack as James Whitehead and skipper Nick Wilkinson led Longridge to 181-4. Whitehead top-scored with an unbeaten 55 while Wilkinson was 30 not out as Longridge reached their target with 10 balls remaining. It meant they finished the season with 19 wins from 22 matches, giving them 230 points in the process to finish 18 clear of Kendal. There were also wins for the seconds, thirds and fourths in their respective games at the weekend. The seconds won by 87 runs against Fleetwood as Josh Stamford (58), James Fairclough (50) and Tom Wood (35) helped them to 202 all out. In reply, Fleetwood were all out for 115 as Jake Durnell took 5-47 and Andrew Simpson 4-36. The thirds saw off Wrea Green by five wickets as they bowled them out for 76 and replied with 77-5. Robert Dickinson took 4-13 as their fourths skittled Walton-le-Dale for 72 and then replied with 76-1 to earn a nine-wicket win. However, the fifths lost against Charnock St James as they were all out for 105, chasing their opponents’ 143-9 in which Elliott Taylforth took 5-43.